For me, this game in general was fun to watch. 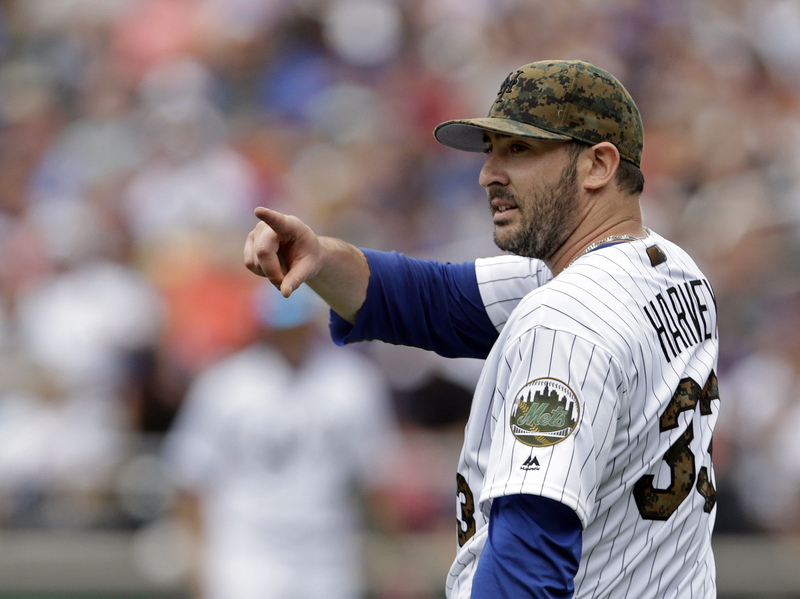 Maybe that’s because I love pitching, and the return of good Matt Harvey gave this one an element of dueling aces. Speaking of Harvey’s return, it was exactly what Mets fans have been looking for all season. Harvey took a perfect game through 4.1 innings before J.B. Shuck singled to right field, and the only two other baserunners he would allow would be an Adam Eaton walk to lead off the seventh, followed by a Jose Abreu single. That’s it as far as baserunners go, which is a large reason Harvey went seven shutout innings for the first time this season. Actually, Harvey’s ability to tame the White Sox led to him making it through the seventh inning for the first time at all this season. Plain and simple, the Dark Knight looked vastly different than he had all season. Not only was he able to command both sides of the plate, but his velocity made a return too. For most of the game Harvey sat 96-98 mph, and he even hit 99 mph in the second inning. For comparisons sake, prior to this start his velocity had been maxing out generally in the 96-97 mph range and he had been averaging about 93-95 mph. So not only was Harvey sitting all game at a velocity range that he was just able to touch on occasion in previous 2016 starts, he was throwing about 3 mph harder on average. It seems that, in addition to Jacob deGrom, Matt Harvey’s velocity issues are on their way out the door. Maybe we’ll see this iteration of Harvey stick around for a bit longer. As for the bullpen, Addison Reed was solid once again, but that has come to be expected. Reed has been lights out in May, allowing just one hit over 10.1 innings of work while surrendering no earned runs and striking out 14. He has been reliable out of the pen and looks to be thriving in the setup role. Jeurys Familia also looked good on Monday, striking out two in a scoreless ninth inning as he notched his 16th save of the year. It was good to see him bounce back from the series he had against the Dodgers with a 1-2-3 inning to wrap up a Mets 1-0 shutout. Going forward, Reed and Familia being able to shorten the game like this creates an even scarier look for a team with the best starting rotation in baseball. The Mets lineup looked decent against Quintana, who is himself more than decent. Coming into this one, the lineup card somehow looked a bit weaker than yesterday, but this time it worked out. Wilmer Flores, Rene Rivera, and Ty Kelly all recorded a hit en route to the Mets recording six hits and two walks on Quintana spread across seven innings. There wasn’t a giant outburst of offense, but they were able to keep the southpaw from looking sharp all day. That being said, it did look like neither side would blink before a Neil Walker home run gave the Mets the only run they would need all afternoon. With the injuries to David Wright, Lucas Duda, and Travis d’Arnaud, the Mets are going to be more reliant on the likes of Flores, Rivera, Kelly, Eric Campbell, Kevin Plawecki, and Alejandro De Aza than they were probably every prepared to be. Most (if not all) of that list were expected to be role players off of the bench in 2016, but are not staring a legitimate amount of playing time in the face. Hopefully a couple of them make the most of their opportunities and break out, because the Mets simply cannot win for long with their current levels of production. That being said, thanks to their solid pitching, the Mets are probably the best-positioned team to still compete when four or five of these players are plugged into the lineup. For how long? Well that is the biggest unknown. The Mets pitched well and the one run coming from a Neil Walker home run was enough to take the first game of the series against the struggling Chicago White Sox. Over the past four days, the Mets have been able to improve Jacob deGrom and Matt Harvey’s individual velocity problems, and the timing couldn’t have been better. With injuries to the lineup, the Mets really need for the rotation (and pitching staff in general) to flex their muscle as much as they ever have. If they can keep improving, the Mets will be able to thwart the early injury bug. The Mets will finally send a strong southpaw of their own to the mound, as Steven Matz will face off against the veteran Matt Latos. A win tomorrow clinches the series, and could give them even more momentum going into a long month of June which is kicked off by a 9-game roadstand.